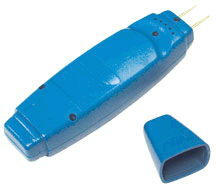 Moister Probe-Hand Held "Wet Check"
FOR CARPET,PAD, UPHOLSTERY, INSERT POINTS INTO MATERIAL. FOR WOOD,PLASTER, DRYWALL, JUST TOUCH POINTS TO SURFACE. * Please call us for any questions on our moister probe hand held inch wet check inch rentals in Langley, also serving Clinton, Freeland, Greenbank, and Coupeville.